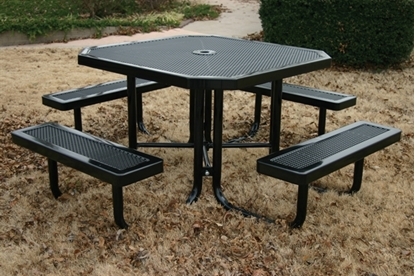 Park Tables offer outdoor picnic tables at great prices. 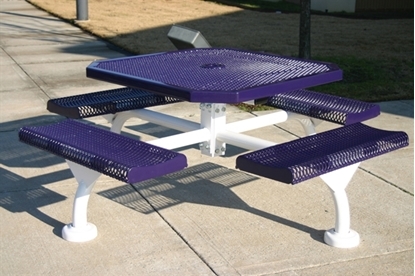 Browse our selection of commercial grade octagon picnic tables that are perfect for parks, schools, and restaurants all over the country. RHINO Octagonal Thermoplastic Metal Picnic Table, Seats 8 Adults, Portable, 250 lbs. RHINO ADA Octagonal Thermoplastic Metal Picnic Table, Universal Access, Portable, 250 lbs. ELITE Series ADA 46" Octagonal Thermoplastic Metal Picnic Table, Universal Access, 3 Attached Seat, Portable or Surface Mount, 219 lbs. 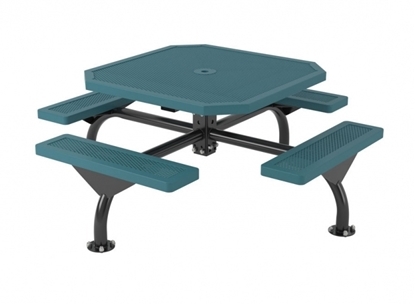 ELITE Series Nexus 46" Octagonal Thermoplastic Metal Picnic Table, Seats 8 Adults, Surface or Inground Mount, 386 lbs. ELITE Series 46" Octagonal Thermoplastic Metal Picnic Table with Rolled Edges, Seats 8 Adults, Portable, 227 lbs. 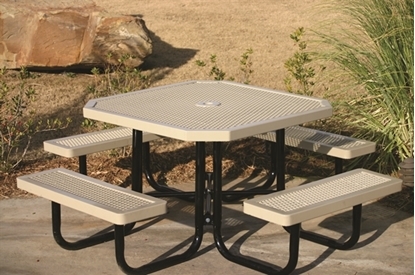 ELITE Series Nexus ADA 46" Octagonal Thermoplastic Metal Picnic Table, 3 Attached Seats, Surface or Inground Mount, 386 lbs. 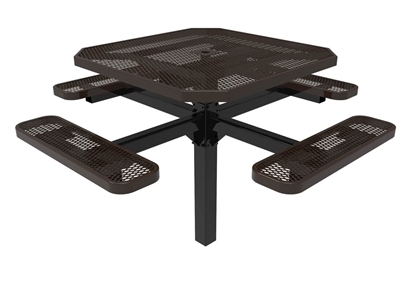 ELITE Series ADA Nexus 46" Octagonal Thermoplastic Metal Picnic Table with 3 Attached Rolled Edges, Stationary Mount, 337 lbs. 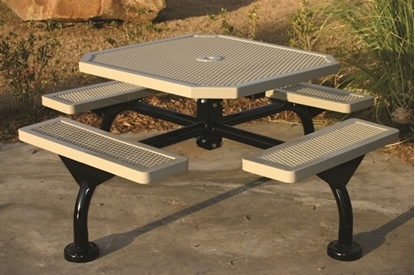 ELITE Series Pedestal 46" Octagonal Thermoplastic Metal Picnic Table with Rolled Edges, Seats 8 Adults, Surface or Inground Mount, 322 lbs. 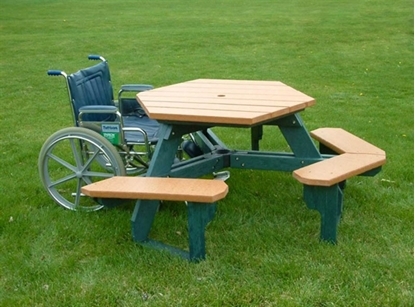 ELITE Series Pedestal ADA 46" Octagonal Thermoplastic Metal Picnic Table with 3 Rolled Edges, Seats 8 Adults, Surface or Inground Mount, 290 lbs. ELITE Series Octagonal Thermoplastic Metal Picnic Table, Seats 8 Adults, Portable, 222 lbs. 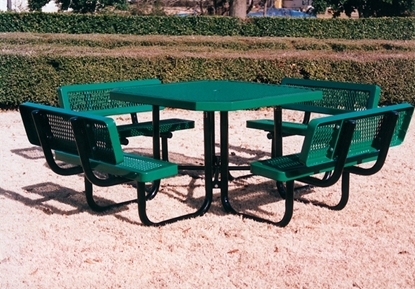 Octagonal Thermoplastic Steel Picnic Table, Innovated Style Seats 8 adults, 266 lbs. Octagonal Thermoplastic Steel Picnic Table, Regal Style Seats 8 adults, 284 lbs. ELITE Series Nexus 46" Octagonal Thermoplastic Metal Picnic Table with Rolled Edges, Seats 8 Adults, Surface or Inground Mount, 386 lbs. 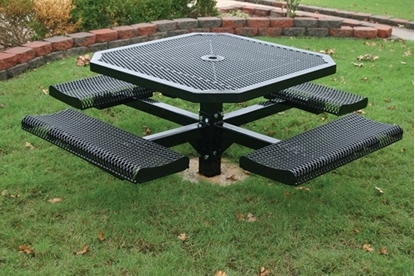 Octagonal Thermoplastic Steel Picnic Table, Perforated Style Seats 8 adults, 248 lbs. 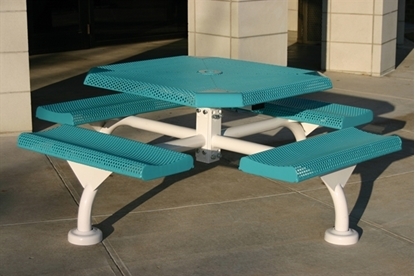 Octagonal Thermoplastic Steel Picnic Table, Innovated Style Seats 8 adults, 300 lbs. Octagonal Thermoplastic Steel Picnic Table, Regal Style, Seats 8 Adults, 407 lbs. Octagonal Thermoplastic Steel Picnic Table, Regal Style Seats 8 Adults, 253 lbs. Octagonal school picnic tables with an octagonal shape use a square top with angled corners. The octagonal picnic table is a variation of square tables and gives easy entry to the attached bench seats. Always on sale at Park Tables, these are at a great price for schools, playgrounds, stadiums, churches, canteen settings, and all outdoor dining venues. Some customers use these octagonal tables to mix and match other table sizes to meet their space plan needs. Trash receptacles can be ordered to compliment the colors and table styles in the area. There are many metal styles to choose from: Regal, Innovated, Perforated, or Infinity.